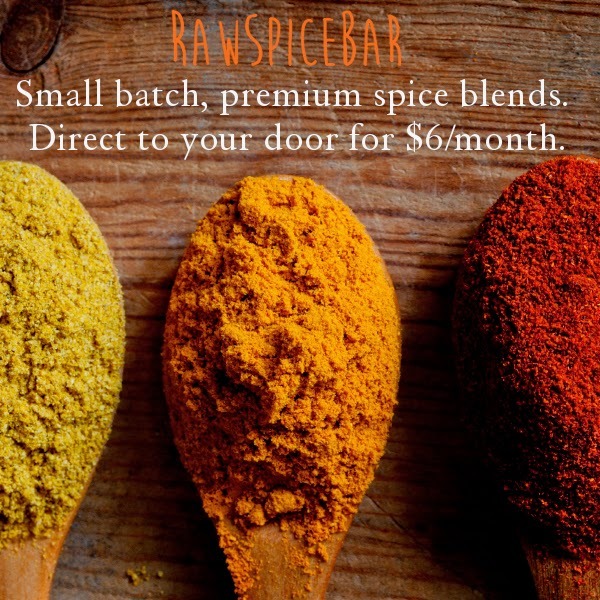 Yesterday I shared my experiences with receiving and cooking out of my RawSpiceBar subscription service. It's a service that send three to four hand-selected, roasted and freshly ground spices monthly with recipes suggesting how to use them. The recipes contain mostly mainstream ingredients and feed a family. Now, RawSpiceBar wants to share and spread the word about its new service. It will provide one of my readers a three-month subscription, which means the lucky winner will net a trip around the world in flavor, all from the comfort of their own kitchen. Rafflecopter will randomly select one winner next week, and there are options that allow you to enter daily. Good luck, readers, and safe travels through taste! I use a ton of cumin. I am bad with favorites! The ones I use most are pepper, cinnamon, cumin and thyme. I am trying to use more tumeric, too! My favorite spice is Basil! We use a lot of Basil! This sounds perfect for me. I love cooking, but finding ways to make chicken taste like more than just chicken is tough for me! Smoked Paprika, Cinnamon, and Turmeric! Haha! I use cinnamon and cumin the most! I love cinnamon for sweet things and sage for savory dishes! It's so hard to pick just one! Lately I've been making my own curry powder- coriander, cumin, turmeric, chili powder, ground mustard, cinnamon, cardamom, and cayenne pepper. I can't pick a favorite! I love them all in different ways. I probably use Sage or Herbs de Provence the most, however. My favorite spice is garlic, Thanks for the chance! My favorite spice is garlic Thanks for the chance! I use cinnamon all the time!!! OOOOOOO!!!!!!! I NEED THIS! I am all about the paprika, and the garlic and the... EVERYTHING! I love garlic, and basil, and lemon thyme! So cool! There have been so many different subscription services popping up recently but this is the first I've seen for spices. I need this in my life! My favorite spices are cinnamon, cumin, turmeric, and curry. My favorite is garlic but my new love is ginger.